THEMIS Image of the Day, December 24, 2018. 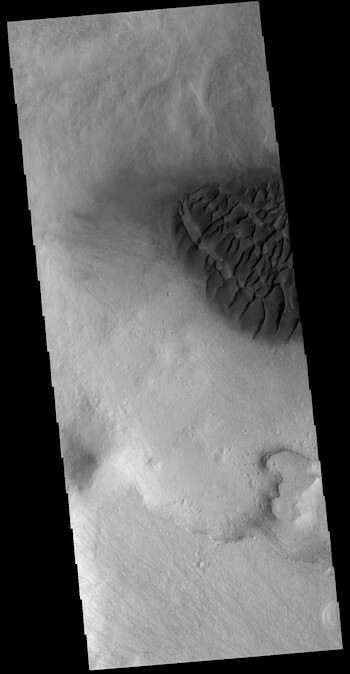 This VIS image shows part of the dune field on the floor of Halley Crater. Rather than small individual sand dunes, the sand here is collected into a sand sheet and dune forms have been created on that surface. Halley Crater is located on the western margin of Argyre Planitia. This entry was posted in Reports and tagged active dunes, Argyre Planitia, Arizona State University, ASU, basaltic sand, Halley Crater, Mars Odyssey, NASA, sand dunes, sand sheet, THEMIS, THEMIS Image of the Day, Thermal Emission Imaging System. Bookmark the permalink.